50% cotton/50% polyester, 9 oz. 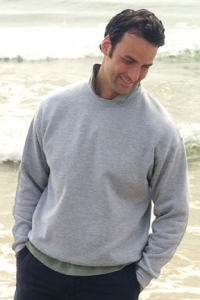 fleece body, crew neck, spandex reinforced rib knit neck, cuffs and waistband, double-needle coverstitched neck, armholes and waistband. Imported. S-3XL.